BONE? MUSCLE? TENDON & LIGAMENT? DISC? NERVE? During traumatic injury, all of those parts of your body could be involved. Only with a thorough assessment, do you fully understand what has been damaged and what needs rehabilitated. Many dismiss minor injury, only to have preventable pain and dysfunction eventually show up, worsened due to degenerative compensation (arthritis). Medical Doctors look for fractures and prescribe medications and hope you heal without calling them again. PT’s attempt to establish muscle restoration without correcting the bony structure. Doctors of Chiropractic address joint function, structural balance, muscle/tendon/ligament/disc injury and manually restore your body to its highest function. In our Chiropractic Office, we have treatments that aid in the proper healing of each component of injury. The body will adapt and the human form will “survive.” But, wouldn’t you rather receive the appropriate professional care so that you can THRIVE! There are different PHASES of HEALING that must be respected with the appropriate interventions being done at the appropriate time! 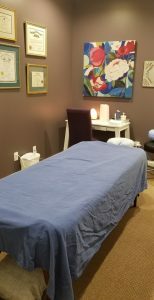 In the initial ACUTE PHASE, you need rest, nutritional support, possible bracing or avoidance, passive motion, and pain and inflammation therapies such as: Ultrasound, Interferential Stimulation, Intersegmental Traction, Ice/Heat, Massage, and/or Dry Needling, all provided in our office. Typically around 4 weeks, you then enter into the STRETCH and STABILIZATION PHASE that generally lasts 4-6 weeks if done properly. Your joints and supportive soft tissues need guidance to re-establish healthy strong patterns achieved with specific Chiropractic Spinal and Extremity Adjustments, Physical Rehabilitation including Postural Correction and Active Stretching. The final phase is STRENGTHENING, completed with specific exercises and activities including Balance and Coordination Therapy to insure that you are fully healed (depending on severity) from your traumatic injury and confident to resume your previous lifestyle…usually feeling better than ever before! Some might fear joint care through adjustments, but, rest assured, we are trained in multiple techniques (Full Spine/Diversified, Gonstead, Extremities) including light force techniques (Thompson Drop Table, Toggle, Activator-non protocol) to manage infants through senior citizens! NOTE: Ligament injuries are among the most common causes of musculoskeletal joint pain and disability encountered in primary practice today. Ligament injuries create disruptions in the balance between joint mobility and joint stability, which can lead to abnormal transmission of forces throughout the joint, resulting in damage to other structures in and around the joint. These can be stressful and confusing with the fear of personal rate increase, proper billing and documentation, and efficient management of the PIP benefit of $10,000 per insured KY driver. Rest assured, we are well versed in the obligations of the insurance companies and have developed excellent relationships over the last decade with the local adjusters…even successfully pursuing cases that are initiated late into the 2-year window allowed to report personal injury claims. Healthcare is not a game. Great healthcare includes proper assessment and case management including expert treatment and thorough documentation. With over 22 years of experience, we are confident, our office is where you need to be. Patient Management Plans with Defined Treatment Goals are created with regard to each case and each condition, Narrative Reports are completed for third party utilization, Progress Reports are produced after each evaluation, Outcome Assessment Tools are used to validate subjective (patient perspective) response to care, Daily, thorough SOAP notes are completed at each visit, addressing each condition.